Call 732-616-6226 to see the active adult community homes in Atlantic Hills. Atlantic Hills is an Active Adult community for people over 55. It’s ideally located because it’s on Route 72 , a few miles west of the Garden State Parkway. Shopping dining and medical facilities are also in the immediate area. Also, your pets are welcome in Atlantic Hills. The association is responsible for lawn maintenance and snow removal, as a result this is no longer a chore for you! Due to reasonable taxes and low monthly association fees, Atlantic Hills is a desirable choice. Between 1987 and 2001, 250 homes were built in Atlantic Hills. In fact, the homes range in size from 1300 sq ft to 1900 sq ft. The homes have either 2 or 3 bedrooms with a 1 or 2 car garage. Additionally, some of the homes have a second floor with a loft. For example, the homes sell around the mid $100,000s to the upper $300,000s. The clubhouse is the social center of the community. Inside you’ll find a multi-purpose room which is used for, well, everything. Also you’ll find a fitness center, arts and crafts, a card room and billiards. When the weather gets warm step outdoors to find the outdoor pool and a gazebo to meet with your friends. 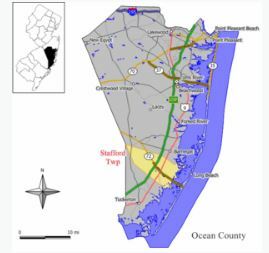 While Atlantic Hills doesn’t have a golf course, there are many courses in Ocean County. In addition, you can pursue hobbies such as fishing and boating nearby. The county transit system, Ocean Ride, provides bus transportation throughout Ocean County. The Reserve-A-Ride Program provides door-to-door, non-emergency medical transportation service to seniors (age 60 and over) and persons with disabilities to medical facilities in Ocean County. Advance reservations are necessary, however, there is a fee for this service.. Furthermore, Ocean Ride also has 12 local bus routes which can take riders to shopping, other adult communities and more.